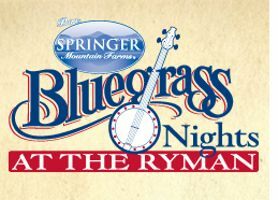 The Springer Mountain Farms Bluegrass Nights at the Ryman 2015 concert series kicks off on June 25 with Grammy® award artist, singer-songwriter and Country Music Hall of Fame member Vince Gill. The annual Red, White and Bluegrass show on July 2 will see the Del McCoury Band with Sierra Hull. Hot Rize and the Gibson Brothers fire up the stage on July 9th followed by bluegrass favorites Dailey & Vincent July 16th. Robert Earl Keen with The SteelDrivers entertain on July 23rd with the Grand Finale July 30th with Ricky Skaggs & Kentucky Thunder. The annual series has taken place for more than two decades, featuring the very best in bluegrass. CMA Air Personality of the Year award winner Eddie Stubbs will once again host each shows in this year's series. Especially important to the history of the Ryman is its significant role in the history of bluegrass music. Although Bill Monroe had been a member of the Grand Ole Opry since 1939, it wasn't until a Saturday night in December of 1945 when bluegrass music as we know it today was born when a twenty-one year old young man by the name of Earl Scruggs stepped up to the WSM microphone on the Ryman stage playing the five-string banjo with a three-finger roll. This was the final ingredient in what we now know as bluegrass music. The inaugural Bluegrass Nights at the Ryman series took place in 1994 at the then newly renovated Ryman Auditorium. The first show featured the father \of bluegrass himself, Bill Monroe, and the angelic Alison Krauss. Over the last twenty plus years, the series has become a Nashville summertime tradition as it regularly presents the biggest names in bluegrass on the very stage where the genre was born back in 1945.